The promise of the new does not always live up to the hype. A computer upgrade, a long-awaited house move or a political vote can all result in unforeseen consequences. So when Scarpa decided to give its classic Charmoz 4-season boot a total makeover, the designers must have had their hearts in their mouths. The Charmoz has been highly praised for 10 years as the go-to boot for mountain scrambling, climbing, via ferrata and mountaineering – and as a general jack of all trades for the keener winter hillwalker who is determined to get to the top of the mountain no matter what. This new version may retain the name, but it’s had a complete makeover in terms of materials and design. The Gore-Tex lining has been removed and replaced with an Outdry membrane, which is bonded directly to the upper without an air gap that would otherwise collect moisture and make the boot heavy and slow-drying. No seam sealing is required either, which improves breathability. The outer materials have been changed too, with L-Tech and Microtech synthetic materials being used; and the new colourways are striking. 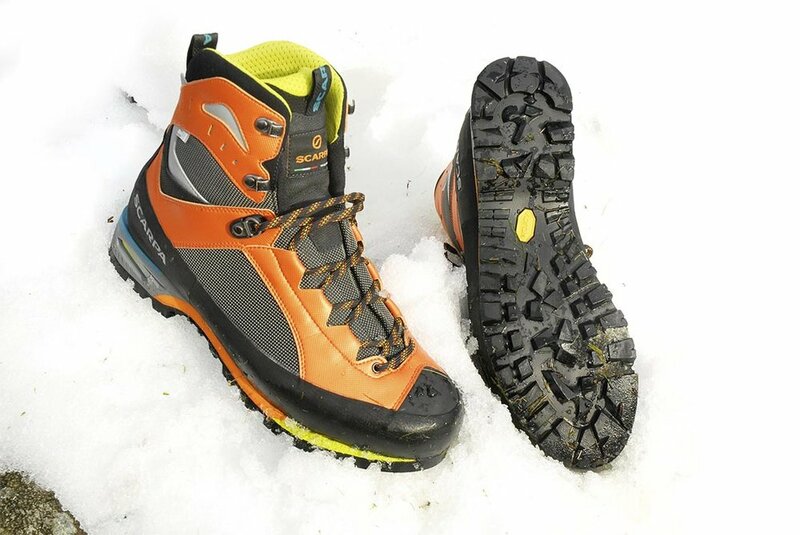 The whole boot is built on a new NAG last, which was co-developed with record-breaking Swiss mountaineer Ueli Steck to provide more precision and power under the toe to allow for easier climbing on smaller holds. Underfoot the new Pentax Precision II XT sole uses Vibram rubber with deep, widely spaced lugs to retain a durable grip for mixed terrain use. The ankle cuff is less cluttered to allow slightly easier forward flex when needed, as well as featuring less stitching to increase durability. A neater system of lacing is provided too, with a locking eyelet below the flex point to retain tension in the forefoot lacing, while improving fit and comfort. On the foot the Scarpa Charmoz instantly feels extremely precise. There is space for the toes to move in the forefoot area, yet there is a very good ‘feel’ under the toe for climbing. That ankle cuff also feels exceptionally comfortable, and when flexed forward there is no bunching in the material. The heel area fits neatly too, and the overall effect is one of precision. There is a very smooth rolling action and gentle slight flex in the toe, which allows for a relatively easy walking action for a B2-rated 4-season boot. The weight of 1782g (pair, size 46) is relatively light for its performance, and even the price tag is relatively low compared to other 4-season boots.